Japan-Related News JOURNEY DOWN EL PONGO, etc. There was a storm today. See this beautiful lake? It isn't a lake. It's my school's baseball field. Yeah. 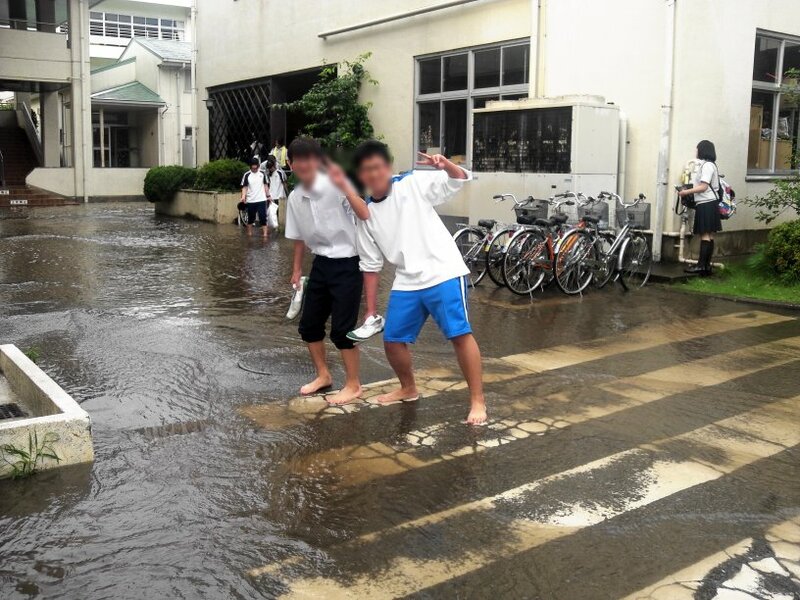 I did as these two boys did—I took off my shoes and socks and waded through the standing water. I walked home barefoot. This put me into a more adventurous mood. 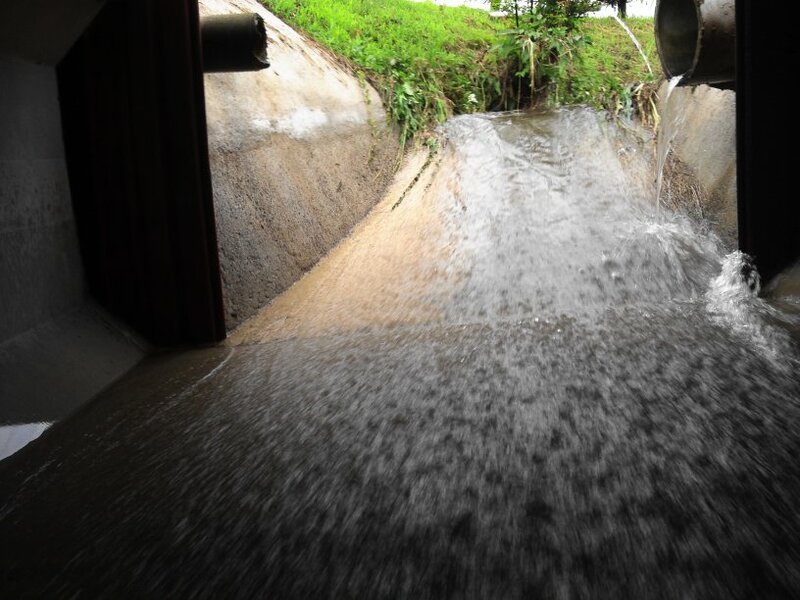 I also saw that the storm ditch, which normally only has a trickle of water, had gotten so full, it had become navigable! 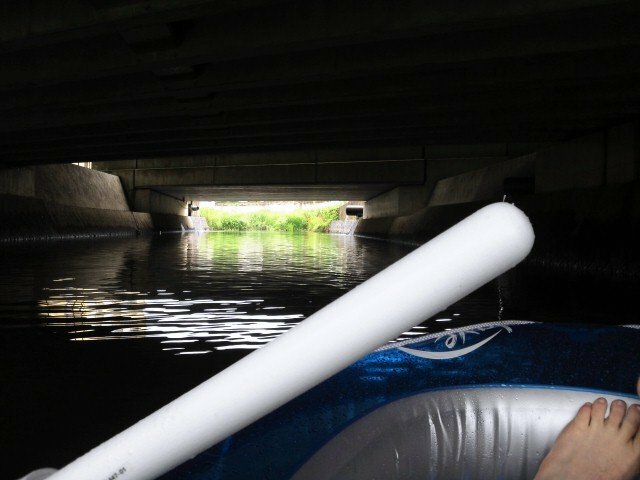 So I did what any guy in my situation would do, and got my inflatable rowboat! The fast current from the storm carried me a surprising distance. 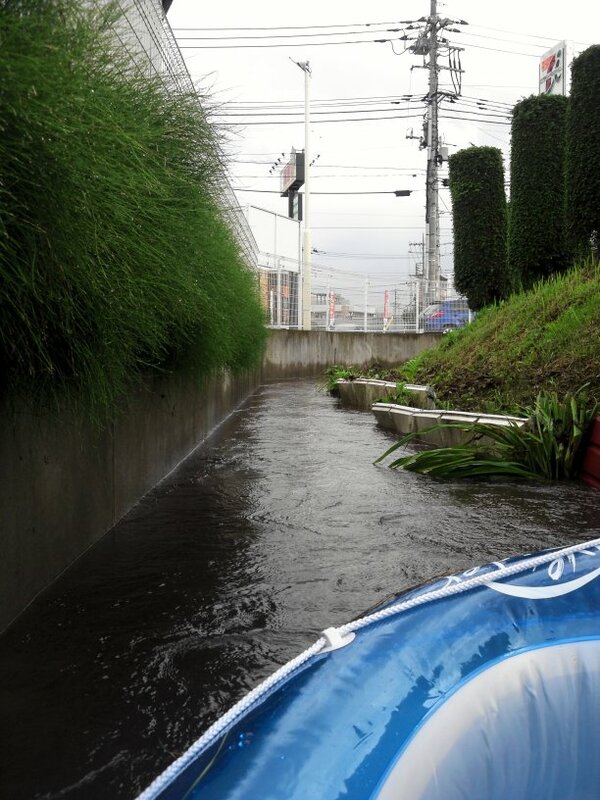 I made it from near my house to near the 7-Eleven, cruising through the drainage ditch, and past a rice paddy. I bagged up my cell phone and my Nintendo 3DS, to keep them from getting wet (unfortunately, the Nintendo 3DS did get wet, and the backlight on the lower screen is now not working—I hope that when it dries out, the backlight returns). Then I prepared to go down EL PONGO!!! AHHHHHHHHHH~!!! EVERYONE, HOLD ON FOR YOUR LIVES!!! WE'RE NOT GONNA MAKE IT~!!! AHHHHHHHHHH~!!! Whew, I'm still in one piece. Wait a second... 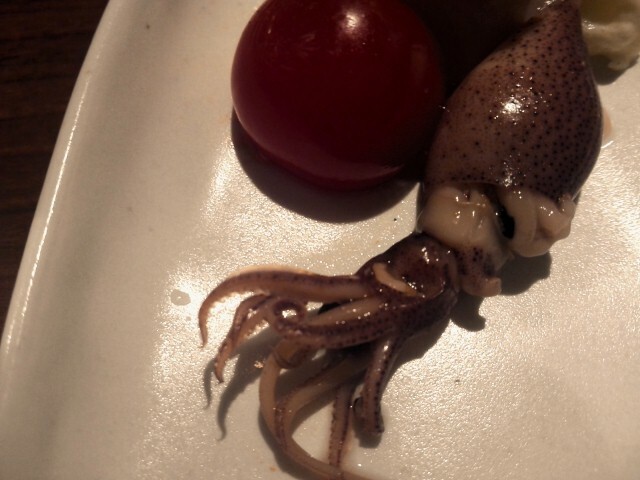 This isn't a snake... Look at the head... IT'S A SEA SERPENT!!! I STILL DON'T HAVE HELM CONTROL!!! WE'RE DEAD IN THE WATER!!! WE CAN'T TAKE MUCH MORE OF THIS! Oops, slight overreaction. 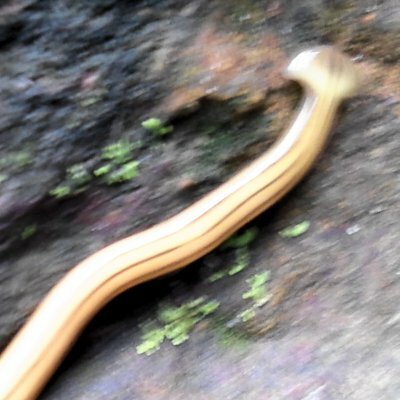 I looked it up on the Internet later, and it's called a "hammerhead worm," which is a type of "land planarian." 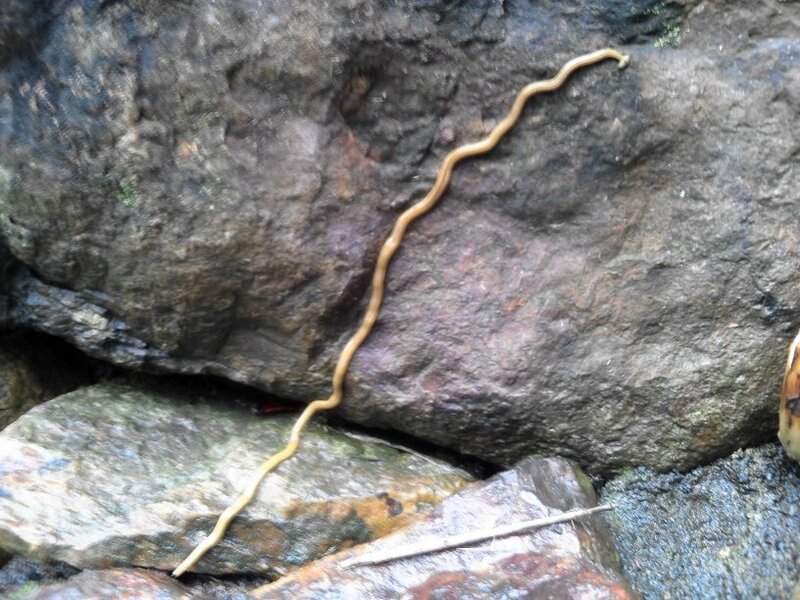 They are predatory terrestrial worms that live in some areas of the world, such as this one. 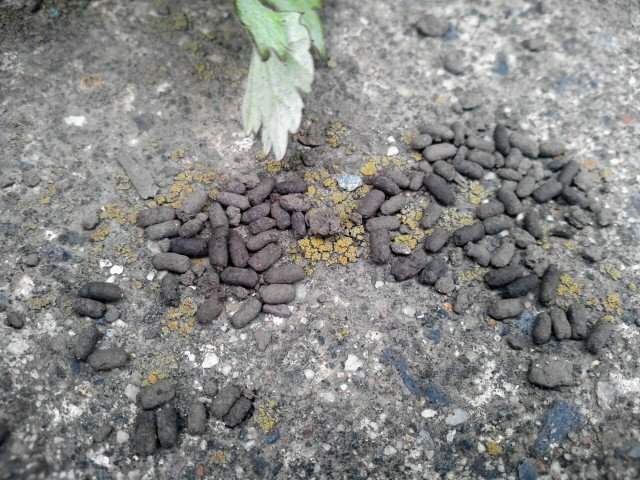 They are often about a foot long, like this one, and attack earthworms, grab them, pump enzymes into them that dissolve them, and digest them from the outside. Lovely. 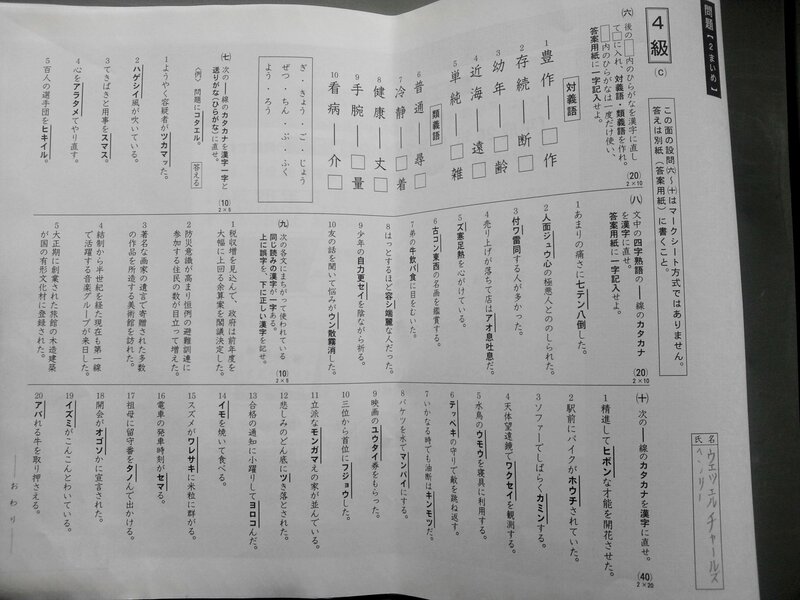 In other news, Nakahara Sensei gave me my questions sheet from the Kanji Kentei I took on Friday. I still don't have the official results (that will take about another month), but I re-took the test in my spare time using the questions sheet, and then scored myself using the dictionary, jisho.org, and some help from some of the teachers at my school. I got 163/200, but I'm going to estimate that my real test is probably somewhere between 150~160/200 because I will no doubt have made some handwriting mistakes or careless errors that I didn't even realize that cost me points. Still, 140/200 is passing. I am now 95% sure that I passed this test. 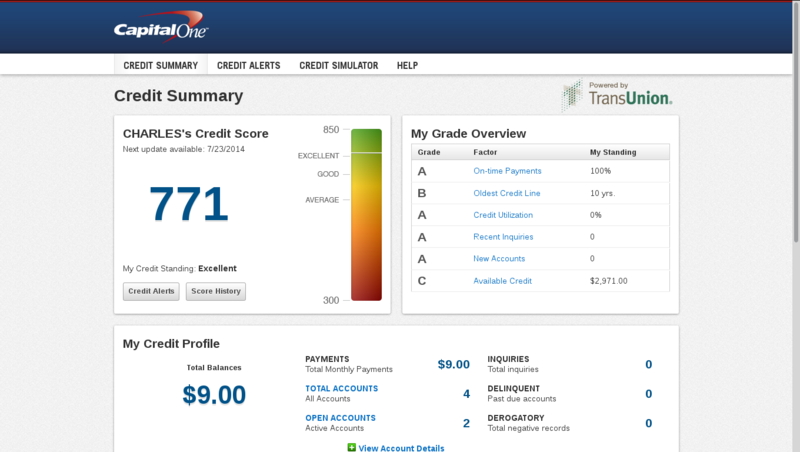 Another major achievement today—I finally reached an "excellent" credit score. Not that it really matters right now, since as a foreigner, I'd be highly unlikely to get a major loan, but, for what it's worth... I have only two non-A grades. Those are oldest credit line and available credit. My oldest credit line isn't my fault—I got my first credit card as soon as I could, at age 18. One needs to have a line of credit for 25+ years to get an A in this category. Available credit, well, the reason I have so little is that I simply don't like applying for a bunch of credit cards and loans. I prefer to pay cash. 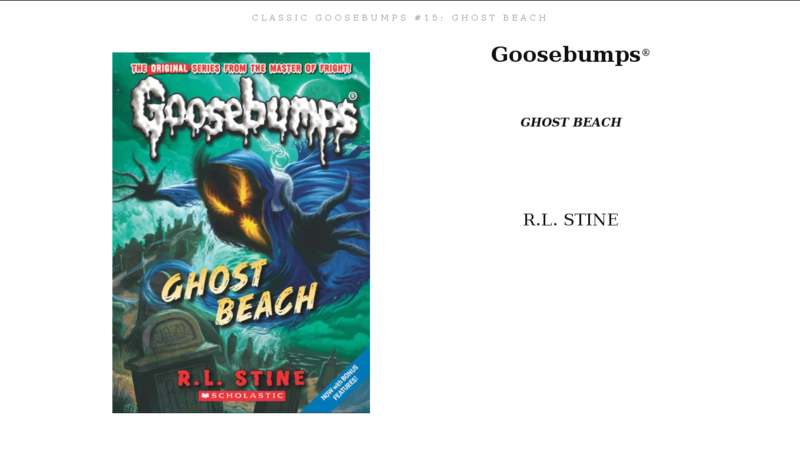 Finally, the last accomplishment for today was finishing Goosebumps: Ghost Beach. Why would a grown man read a Goosebumps book? Well, simply put, when I was in elementary school, I never actually finished one of these things. Now, I have, in its 119 pages of glory. It wasn't a bad book. Jerry and Terri go to New England to stay with their distant cousins (who are much older than them), Agatha and Brad. They run into three local kids named Sam, Louisa, and Nat, and find out about a haunted cave. They eventually go into the cave and find an entity named Harrison Sadler. Harrison Sadler says that Sam, Louisa, and Nat are ghosts and must be stopped. Sam, Louisa, and Nat say the same thing about Harrison—so is Harrison a ghost or a human? It turns out that Harrison, for all his creepiness, is a good guy, and the three children (Sam, Louisa, and Nat) were the real ghosts, and planned to kill Jerry and Terri. Jerry and Terri manage to escape the cave, and the cave caves in, trapping those three ghosts. However, Jerry and Terri are ultimately doomed, as it turns out that Agatha and Brad are also ghosts (as the children are tipped off by a German shepherd which can sense ghosts). It definitely wasn't the best book I have ever read, but I can understand the appeal of it to elementary school-aged kids. I'm glad I bought it for $5.38 on Amazon Kindle and read it; not only was it mildly entertaining, but it was some good early '90s nostalgia. 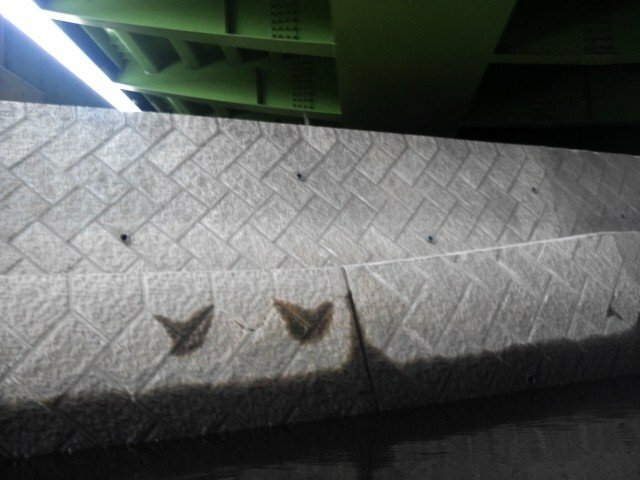 Japan-Related News The Kanji Kentei 4-kyū, the Tsuyu (rainy season), etc. 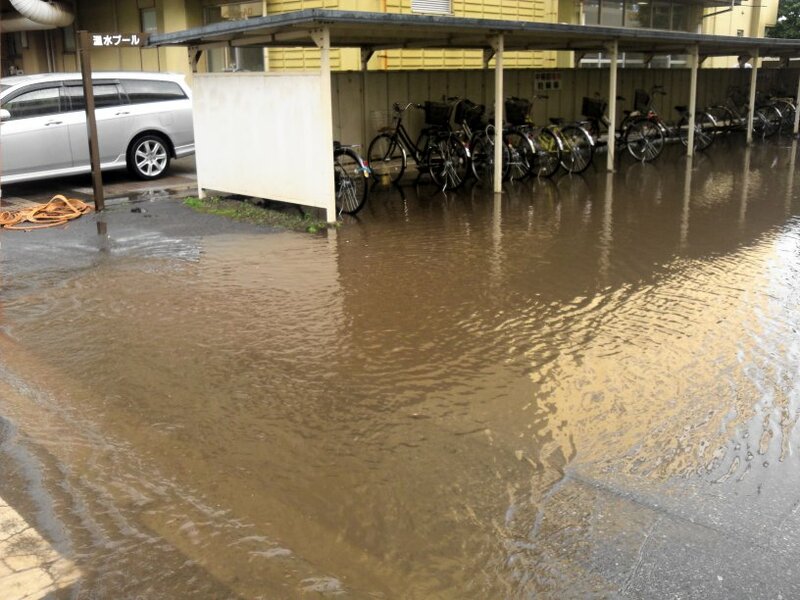 Lately, it has been raining (it is the rainy season, or tsuyu in Japan right now). 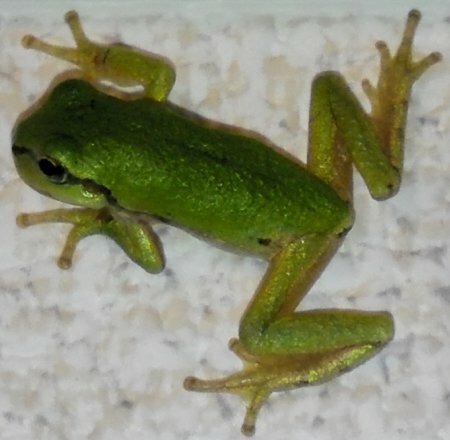 Some interesting creatures have come out, like this frog (I carried it back to my apartment, then took a picture, then let it go). 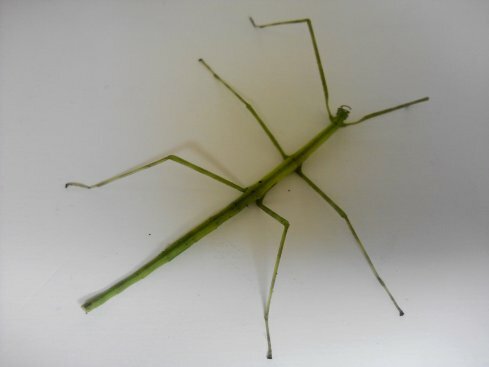 This is a stick insect, another interesting find. 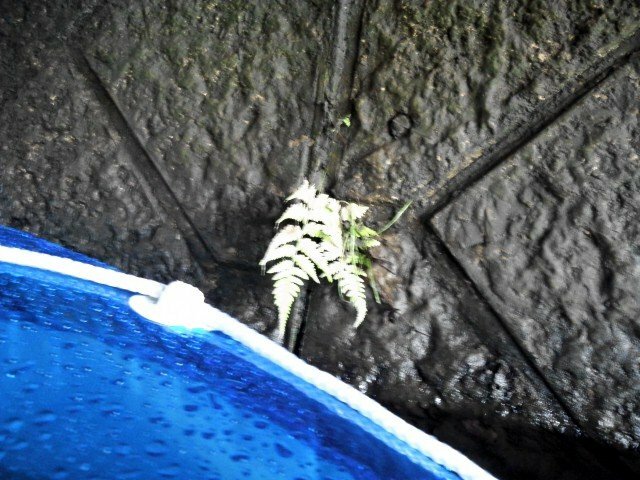 I found it during the tsuyu rains on Wednesday night. We had special school lunches this week. 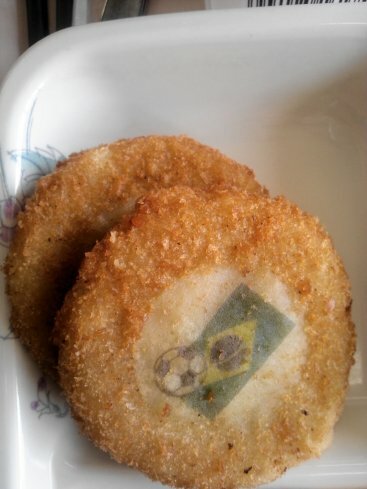 This is one of my student's korokke with the Brazilian flag on it (because the World Cup is being held in Brazil, now). 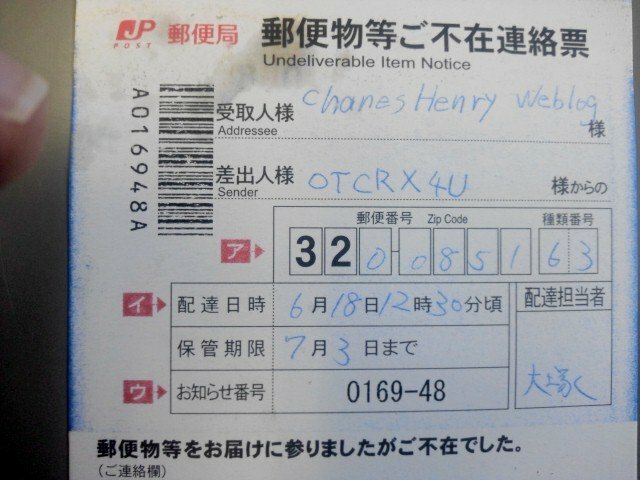 I received a package this week. Got to love the amazing attention to detail of the Japanese people. As for other news, this week, I took the Kanji Kentei 4-kyū exam. If I passed, I will be certified for 1,322 kanji (the same amount that a Japanese 8th or 9th grader is expected to know). To study for this exam, I fed all the official on'yomi and kun'yomi for the kanji and the kanji themselves into Anki (all 316, combined with the 1,006 Kyōiku Kanji that were already there from when I took and passed the 5-kyū back in 2011), and memorized them. 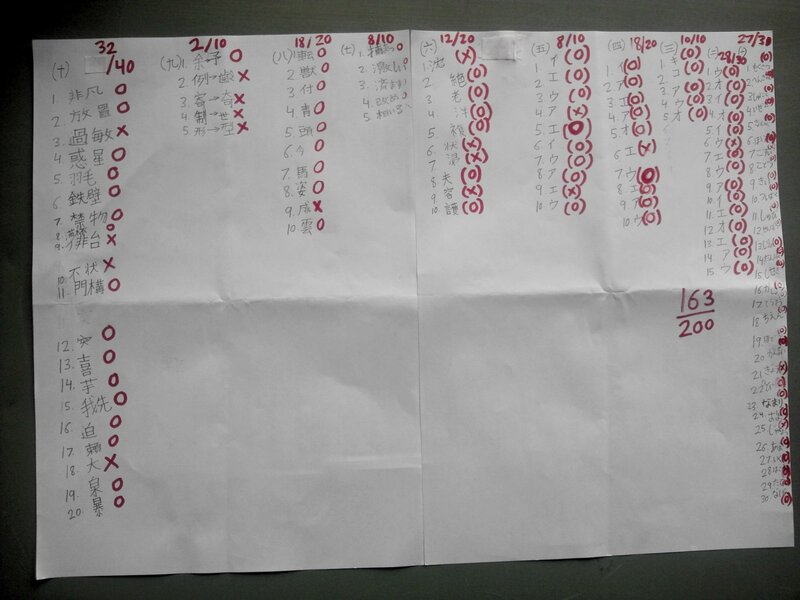 I also sat down outside of the classroom where I would take the exam the next day, and took a previous exam, from 2012, to test myself (I got exactly 142/200 or, if very strict about one of the kanji's appearance, 140/200, which is exactly the pass mark). I also read up to page 213 of the 303-page book that I had on the Kanji Kentei 4-kyū and also read the last seven pages (the kanji tables) in their entirety and fed the special readings from page 296 into Anki and memorized them, as well, and read all the yojijukugo pages, as well. I also wrote many pages of notes, some by hand, some by computer, and re-read all the notes in the packet before the exam. I think I passed. I will have to wait about a month to see the results, though. This test has a 52% pass rate. Most of the people who take the test are Japanese native speakers. If I pass, this is something to be proud of. Very few westerners ever break what I call the "1,000-character barrier." Basically, many westerners can speak and understand Japanese, but I have come to realize relatively recently that just because they can speak and understand it does not mean they can read and write it. Many foreigners who appear fluent or near-fluent in the spoken language often only know a few hundred characters. It is difficult to retain more than a few hundred characters without using a spaced-repetition system (SRS) like Anki. Someday, I hope to get certified for over 2,000 kanji. That is full adult literacy. There are currently 2,136 kanji in the Jōyō specification, which is what high school graduates are supposed to know (though many actually do not). If I passed this test, I will officially know about 62% of these. Though I will comment that most things are written below a high school graduation literacy level, so even with the number of kanji I know now, I can read the kanji in most things fairly well. Today is June 18, 2014. In addition to being the 199th anniversary of the Battle of Waterloo at which Napoleon was defeated, it is the 8th anniversary of me boarding a plane in America and departing for Seoul, South Korea (I did not reach Korea until June 19, so tomorrow is my 8th anniversary of moving back to Asia). As of tomorrow, I will have spent eight continuous years living outside the United States of America, in Asia, and that combines with the five years from when I was a minor to make 13 years in Asia. When combined with the ~10 months that I spent in the Netherlands as a baby, that makes 13 years, 10 months, or literally more than half of my life spent outside America. I am truly an "overseas" American. Stepping onto that airplane and coming back to Asia (and ultimately Japan) was the fulfillment of a dream that I had had since I was 14 years old. When I was 13 years old, I moved back to America from Hong Kong. At that point in my life, I had spent five years in Asian countries (two in Korea as a small child, three in Hong Kong as a middle school student). I had spent more than 1/3 of my life in Asia, at that point. I was very hopeful about living in America. During three years in Hong Kong, I had formed a very romantic image of America. However, the reality did not live up to the image. By the time I was 14, I was definitely disappointed about moving back to Fairfax, Virginia. It was because I had grown accustomed to the wonders of Hong Kong--a world class city of 7 million people, one of the most important cities in Asia, a gateway between the West and China, with Shenzhen and mainland China right nearby, a place where cutting-edge Japanese video games were released almost immediately, a place where I sometimes snuck out at night and saw "the nightlife" a place where I could practice Chinese almost any time I wanted to and have it be understood, and a place where most of my friends were overseas Americans, like me. I had been transplanted from this world into Fairfax, Virginia--a boring, suburban "bedroom community," where the local school only offered European languages (offer Latin, sure, why not study a dead language, but offer Chinese, no way), where people doubted me when I said that China was going to be the next superpower, where everything was closed by late evening except for 7-Eleven, where it was difficult to get to any place worth going without a car, and where rents were so sky-high (often ~$1,000 for a studio apartment) and the minimum wage so low ($5.25 an hour), that it seemed like I would never be able to move out of my parents' house. It was at approximately age 14 that I decided I had to move back to Asia. I was already tired of Fairfax. I thought "If I'm going to move back to Asia, why not Japan?" 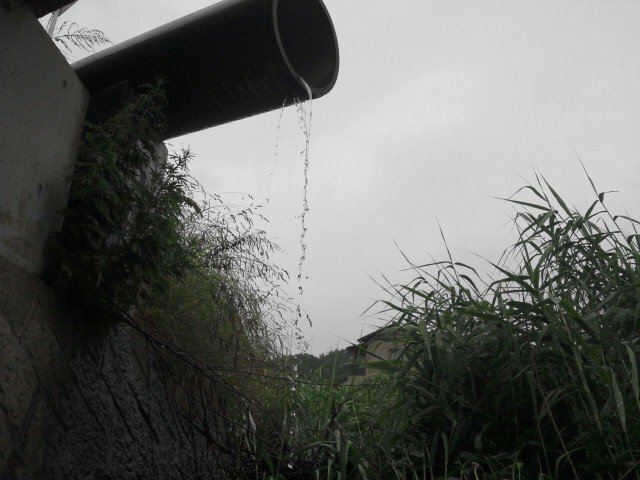 After all, I had become fascinated with certain Japanese things over the past few years. I had begun to self-study Japanese and learned all the hiragana and the katakana, completing the programs prgmHIRAGANA and prgmKATAKANA for the TI-83 graphing calculator, written in TI-BASIC, which allowed display of all the hiragana and katakana on that calculator, and which I eventually put into the Japanese quiz program that I made, NihonGO! Japanese Kana Learning System. I had heard J-pop on the radio on the planes between Hong Kong and Japan and America and Japan, beaten many Japanese video games, and enjoyed some anime, too. I desperately wanted to move back to Asia, especially Japan, and practically worshipped everything Japanese. However, the road to getting back to Asia was long and hard. I had to go through four difficult years of high school. High school is difficult for many people, but it was especially difficult for me, because I desperately wanted to study either Japanese or Chinese; although these languages were offered at better high schools such as Thomas Jefferson and Lake Braddock, I went to Robinson Secondary School, where only European languages were offered. Spanish was instead being forced down my throat. I desperately wanted to move back to Asia, but the law said otherwise--I had to stay with my parents until I was 18, even though, at that point, I had become accustomed to Asia, spent more than 1/3 of my life there, and desperately wanted to return. I desperately wanted to save money so I could afford Japanese lessons and/or move back to Asia, but the Early 2000s Recession from 2002-2003 made finding a job almost impossible for a high school student. I desperately wanted to move back to Asia, but was being prevented from taking any steps to do so. However, in 2004, things started to improve--the Early 2000s Recession was over and the economy had improved. I was able to find a steady job at Domino's Pizza for $5.50 an hour, and later that year, at 7-Eleven for $8 an hour on the night shift. I also turned 18, which meant that legally, there was no barrier to me moving out/moving back to Asia provided that I had the means to do so. Suddenly, I was saving money at a fast rate, and was working with Koreans, who often taught me some Korean. However, at this point, I was thinking more about using the money I was earning to buy a manufactured home. After researching the manufactured home idea, I realized that parts of it would be difficult. And suddenly, I saw the light--I should use this money to move back to Asia instead. I started to take very serious steps to move back to Asia. I started taking Korean classes through the Fairfax County Adult Education system at Marshall High School in the evenings (these had not been open to me before I turned 18, but after turning 18, I was eligible, and they were cheap). With the Korean teacher Lee In-ae, I learned elementary Korean in Levels 1 and 2). 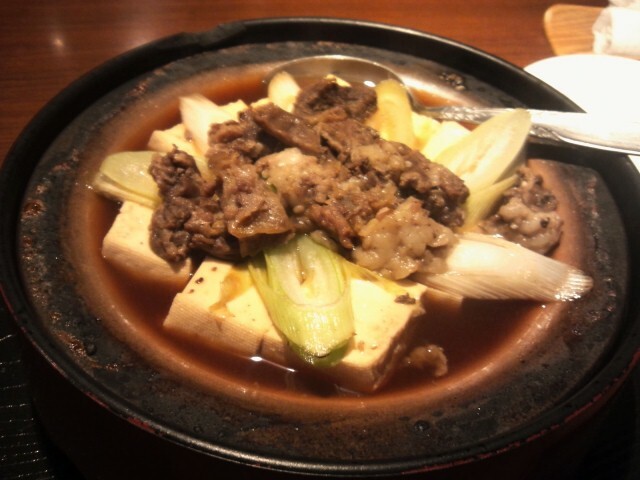 I practiced this Korean at local Korean businesses, like in Burke Center Parkway. I was starting to save a lot of money--at age 19, I had over $20,000 saved. In early 2006, I finally took a major, drastic step--I applied to both Yonsei University's and Sogang University's Korean schools. I was accepted to both, but ended up choosing Yonsei University Korean Language Institute. And finally, on June 18, 2006, I got on a plane. And arrived in Seoul, South Korea the next day. It was the fulfillment of a dream, to move back to Asia, that I had had since I was 14 years old. It was literally one of the most important days in my entire life. Now, I should explain, I ultimately decided not to stay in Korea. I moved to Taiwan in search of work that I could do with an associate's degree, then finished my bachelor's degree, then moved to Japan, so the dream of moving to Japan was not completely fulfilled until March 7, 2011, but the most drastic step was on June 18, 2006. Not only was that the day that I moved back to Asia--it was also the day that I became an independent adult--I was using my own money earned at low-wage jobs in America, and refusing any significant money for my living expenses or tuition from my parents, once I was abroad. On June 18, I declared independence, both as an independent adult (including financially), and from life in America. 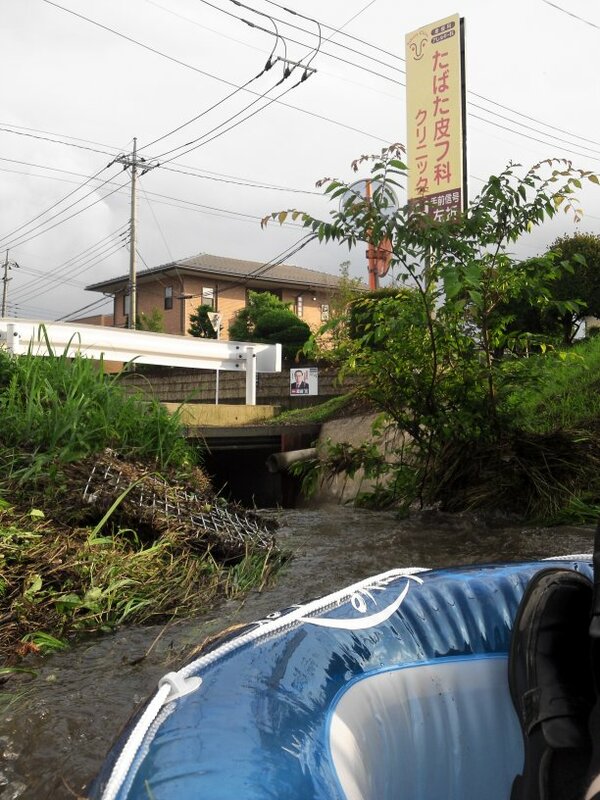 Two weeks ago, I bought an inflatable rowboat from the "recycle shop." 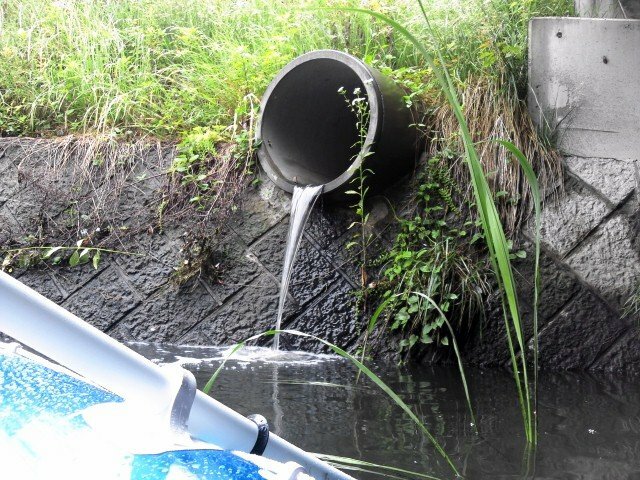 Stay tuned, and I will post photos from my "exploration" of my local river. 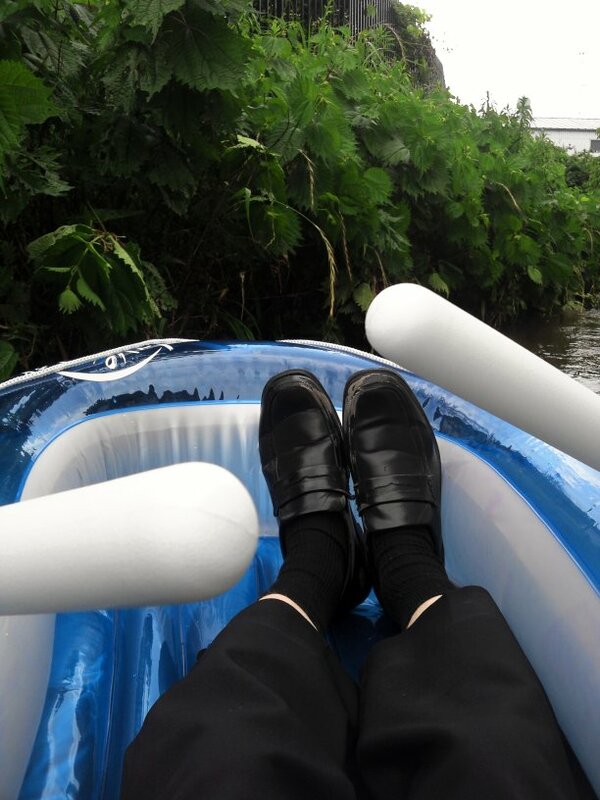 I acquired this rowboat for ¥1,080 from the "recycle shop" in Tsuruta-machi. 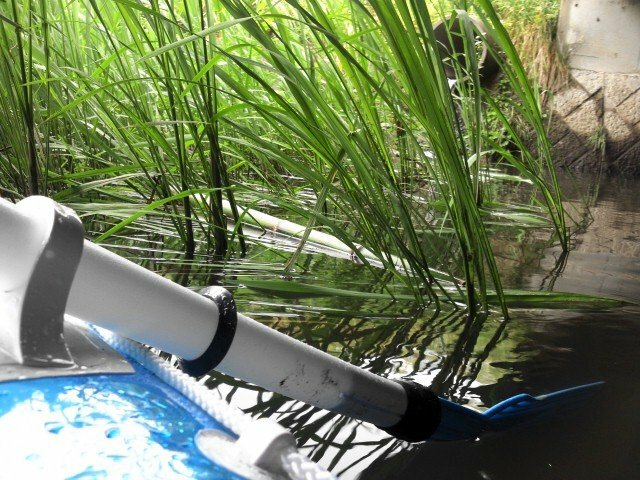 I have dreamed about having an inflatable rowboat since I was living in Korea, to explore local rivers and lakes and get unique photos. 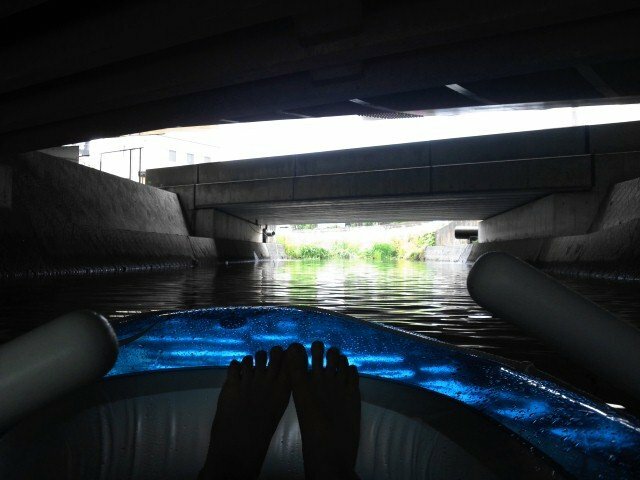 The day I bought it, I took it to the Tagawa and accidentally woke up a homeless man sleeping under a bridge with my loud pumping to inflate the boat using my hand pump. He woke up and started yelling, so I apologized and went farther down the river. 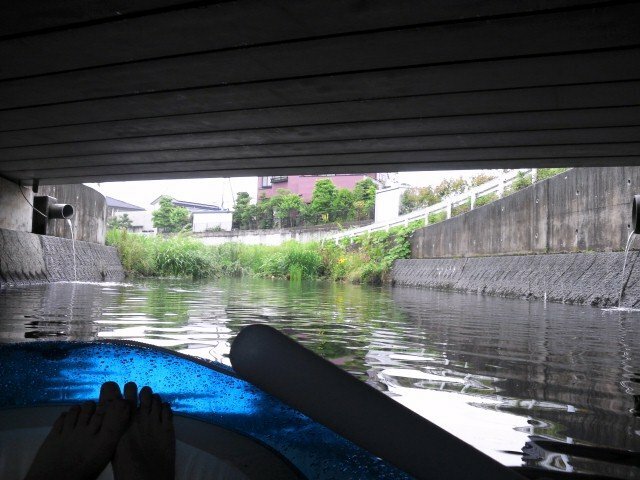 I was able to test the boat in the Tagawa, but it was not until the next weekend, in the Komanyū River, that I was able to really enjoy the rowboat. I not only spent a couple of hours in the boat on the river, but also created a chart of all the Kanji Kentei 4-kyū kanji with radicals that are not the first part of the character (this will help me on the bushū section of the test) while on the boat on the river, and called my girlfriend to inform her that I was on a boat, and to call me "Captain Charles." I would like to take her out on this boat, sometime, by the way. She only weighs about the same as four sacks of rice, so I think the boat could still stay buoyant even with both of us aboard. 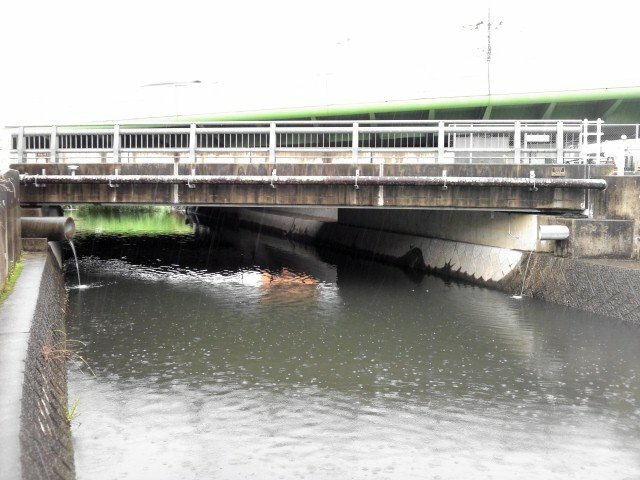 This is the Komanyū River. 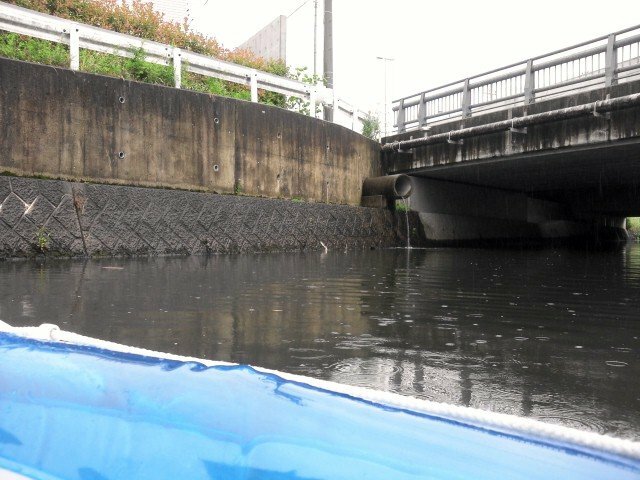 It is the closest "navigable" river to my apartment (less than ten minutes away on foot). 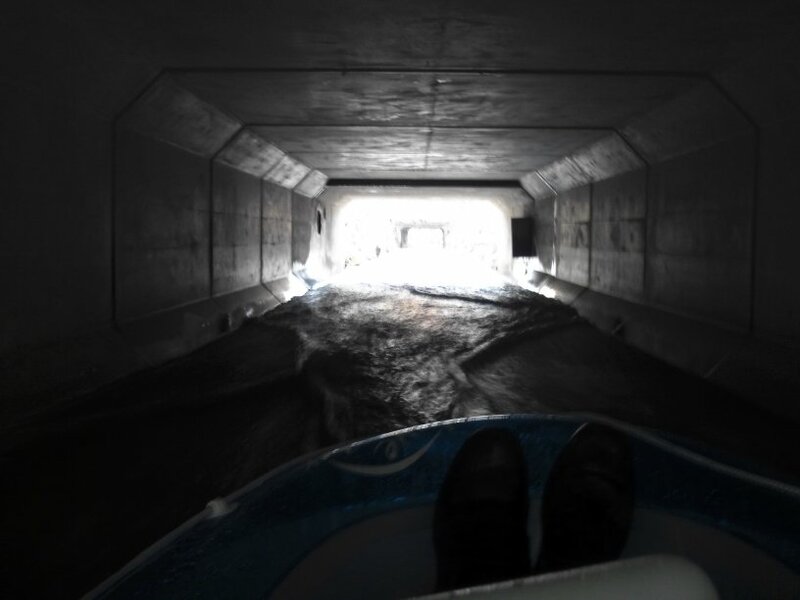 Here is a view to a building from my inflatable rowboat. It was raining at the time. 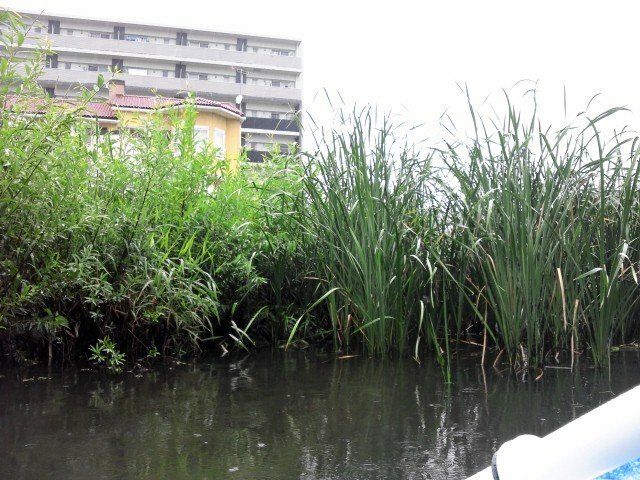 Dense foliage at both ends of the navigable portion of the river prevent the rowboat from being able to go more than a couple of minutes in either direction, unfortunately, but it was still fun to test out my new inflatable rowboat which I hope to take out on a lake, like Chūzenji (a lake in Nikkō, which is near Mt. Nantai and also where the Italian Embassy has their "resort" house), at some point. 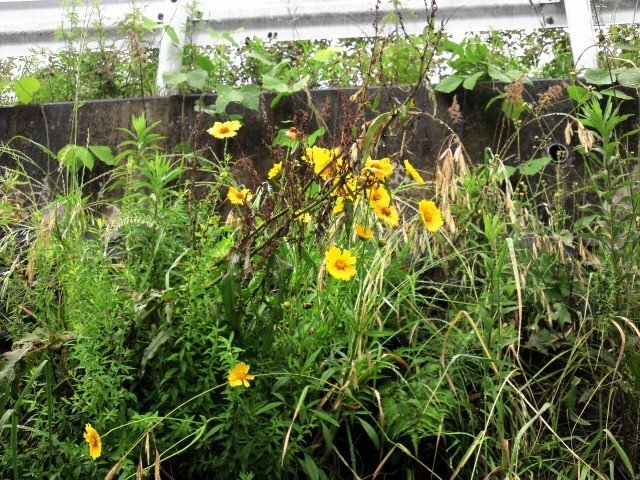 These are some flowers near the point where I launched the boat. Launching the boat required getting my legs wet, because there is no bank or anything—there is a dropoff of a few feet, and then water. 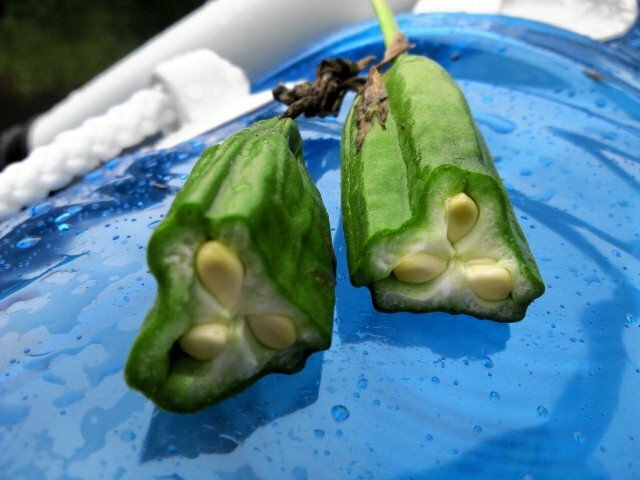 From the outside, these look like okra. 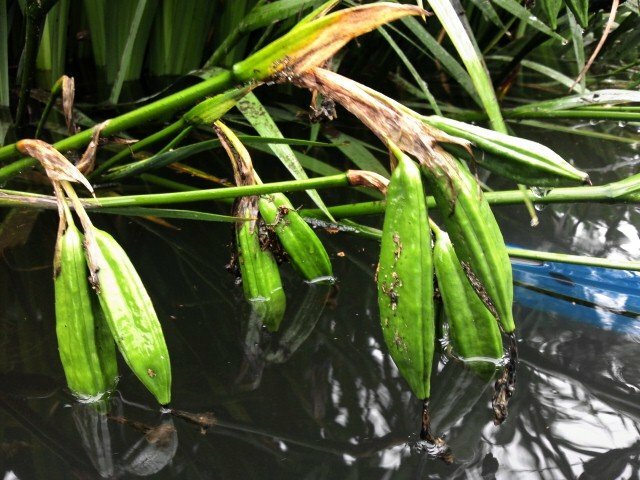 However, breaking open one of the fruiting bodies revealed that it was not really okra (okra typically has rings of five seeds or more, not three). I wonder what kind of plant this is, and if it is edible (I did not try it to find out). Note to self: This would be a great place to go camping to "get away from it all." 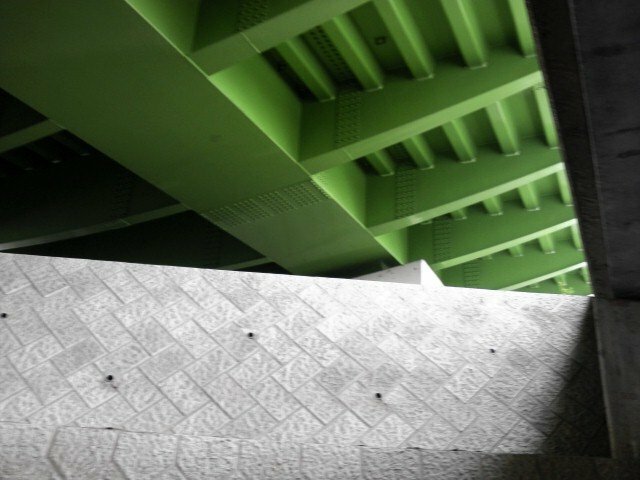 It is a cement ledge large enough to pitch a one-man or two-man tent, located under a bridge (but actually not noisy at all), completely inaccessible except by boat or swimming. No one would bother me here! Tomorrow, CMIS 320 (Relational Database Applications and Concepts) starts at UMUC. This will be an online course. Okay, it actually starts on 6/2, but I will be able to access the course (and start on it) tomorrow, so I consider that its effective start date. I therefore decided to go ahead and finish up studying the 316 Kanji Kentei 4-kyū kanji (one fewer thing to have to worry about over the next month). 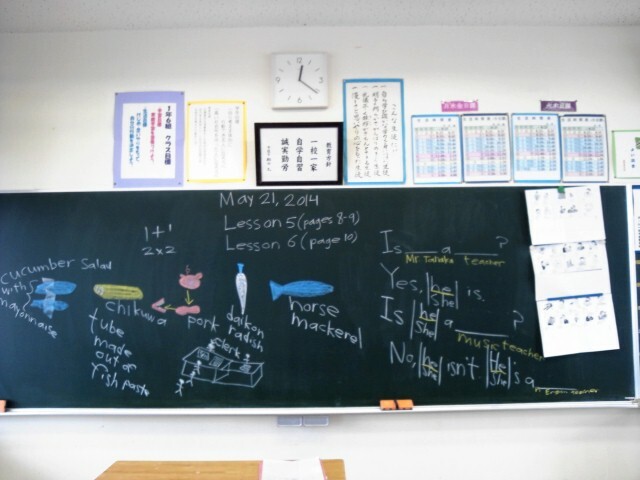 This is the exam that I will be taking on June 20 of this year, with my junior high school students at my school. I finished cramming them today. Over a couple of years, I have fed all 316 kanji for the 4-kyū into the Anki program, complete with the English meaning, the kanji itself, on'yomi, and kun'yomi. 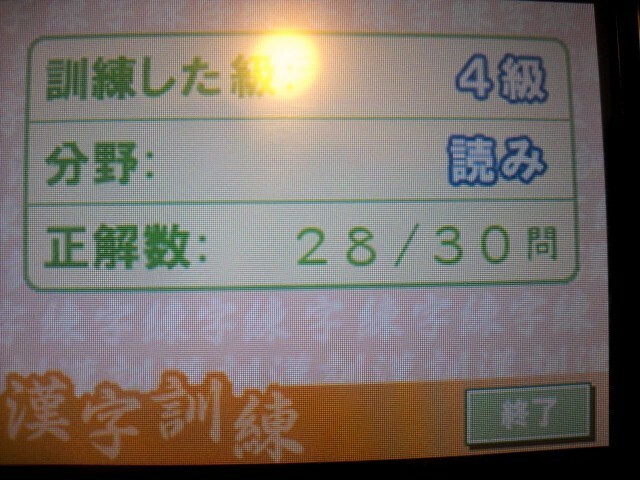 Then I used a Nintendo DS-based kanji quiz program to test myself. See how I got 28/30? Not bad. That means I retained them. If I can pass this exam, I will be certified for an official 1,322 kanji, versus the 1,006 that I am officially certified for right now. 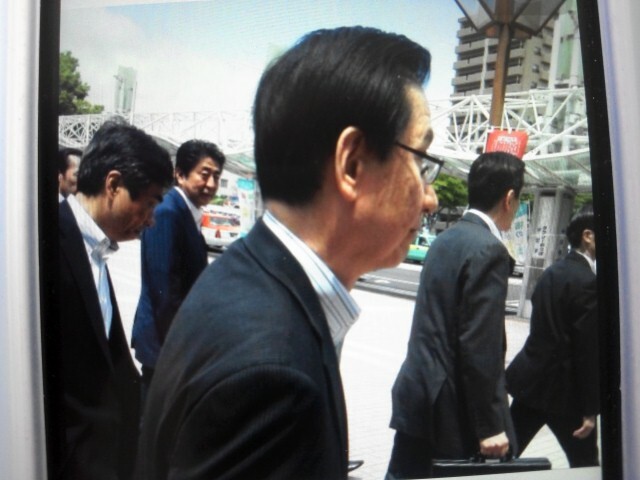 That's Prime Minister Abe Shinzō in the picture. Everybody was amazed that he was there, and my student said that I could use this picture on my blog. Speaking of food, I taught my students on Wednesday some food words for their lunch that day. I also taught them adjectives and "Is n. a n.?" grammar in the same lesson. Just keep up with any work that is assigned. Just do what is required. Do not go above and beyond, because I won't have time. May 26-June 15: I have already fed all 316 of the kanji for this test into Anki and memorized them. 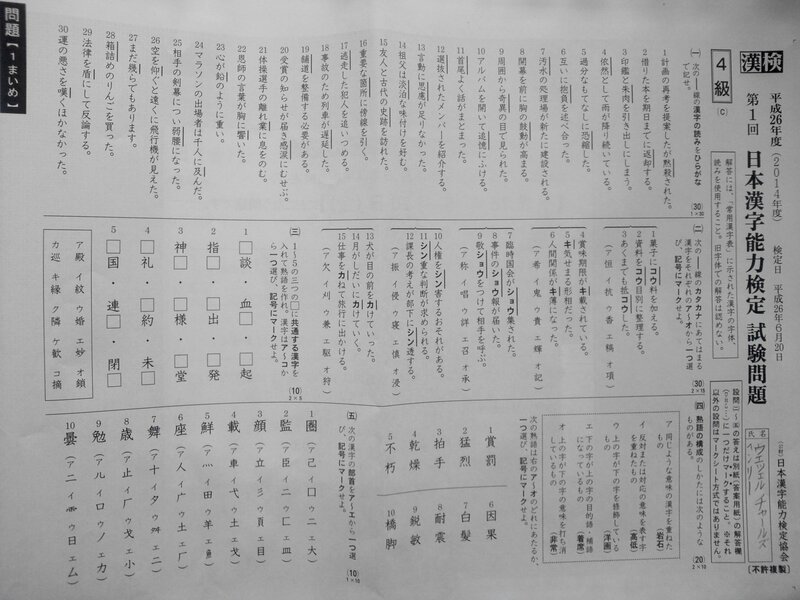 However, I should now work my way through Ichimon'ittō KanKen Puchi Drill 4-kyū (a study guide for the exam). To finish the whole book in this time frame, I will need to do 15 pages per day. I should take notes from these pages, of course. June 16-June 20: Spend the last five days re-reading my notes, taking a practice test, seeing how I do, and doing any last-minute studying necessary. June 6-July 6: Having finished all vocabulary (done already), kanji (done already), grammar (June 5), and with the listening underway, I will simply need to drill what I have already learned, especially the grammar. I would also like to do a light review of JLPT N3 stuff (especially grammar), and a very light review of JLPT N4 and N5 stuff. This stuff is going to keep me extremely busy. I expect CMIS 320 to take approximately 1.5 hours per day, the Kanji Kentei 4-kyū study to take 1.5 hours per day, the JLPT stuff to take two hours per day, and Anki reps to take an hour per day. This adds up to about six hours per day of stuff I have to study or work on. I plan to start taking the bus downtown more often to free up time, even though it will be more expensive, for one thing, and may come up with some other ideas to save time, later. I have also been experimenting this year with six hours of sleep per night instead of seven, and will probably have to do this during the "trial by fire" time. 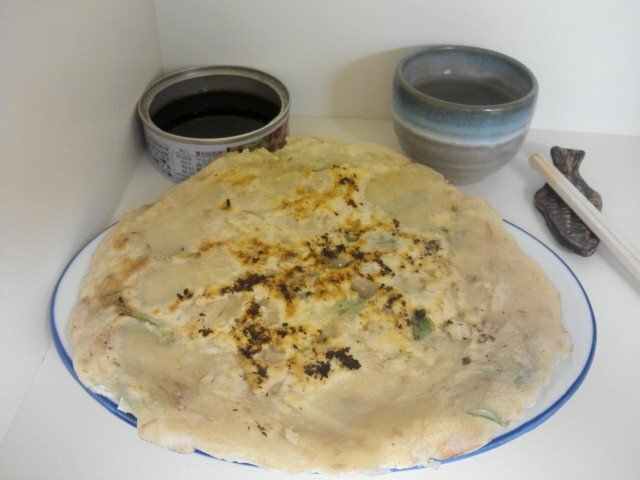 Another thing I might do is cook my food in large batches or have pouches of curry or hayashi that I can just heat up. I usually get off work at 4:30 PM and can go to bed as late as 1:30 AM, so that's a potential nine hours. Passing all three of these things during the "trial by fire" period is possible, I think, if I have discipline. 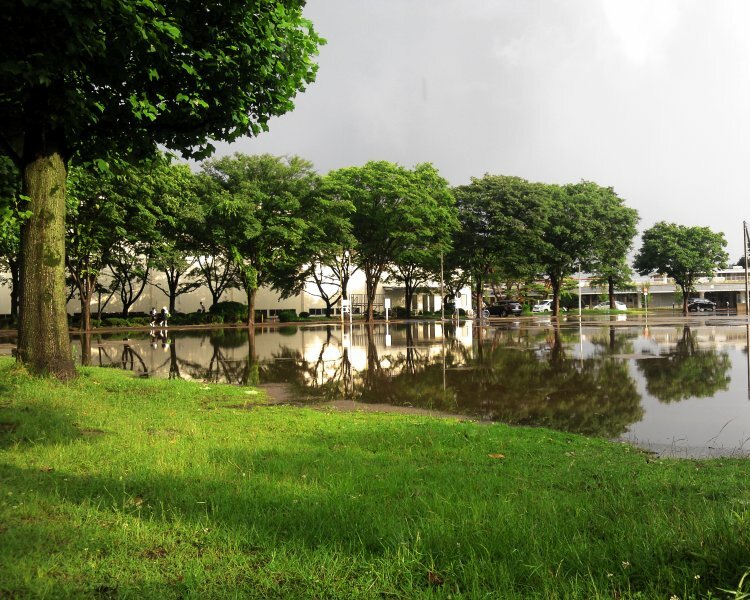 This picture was taken on a sports field on campus, near the junior high school. 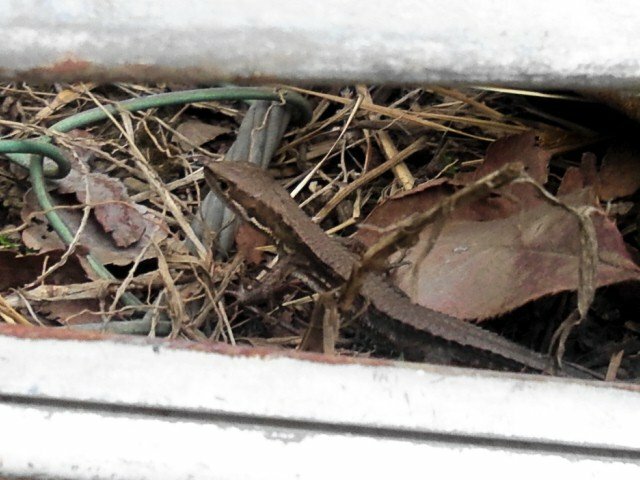 I see these lizards here in Japan relatively frequently. However, I have never been able to photograph one up close like this, because the Takydromus genus, to which this lizard belongs, is called the "oriental racers" genus, and they weren't kidding when they named that genus. 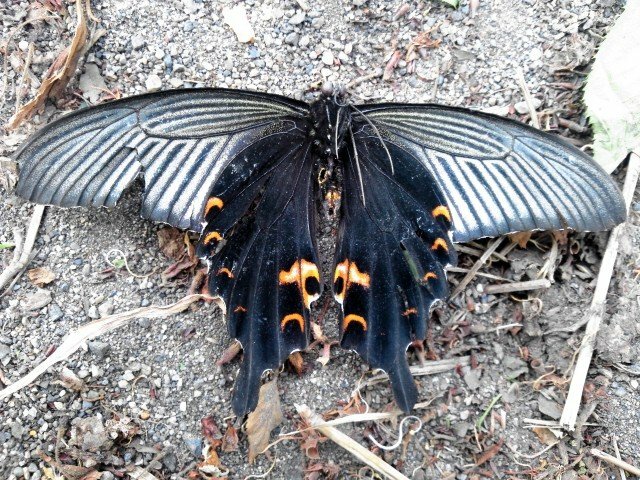 I got lucky with this one (though it ran away soon after I took this picture when I tried to take another picture even closer). I also signed up for another (online) college course today. This course is CMIS 320 (Relational Database Concepts and Applications). I had originally been planning to take CMIS 242 (Intermediate Programming [in Java]), but I decided, I need something a little bit easier because I will also be taking the JLPT N2 in the middle of this class. I think that an introductory-level course in relational databases will be easier than intermediate-level Java, so I will save intermediate programming (in Java) for later when I do not have to worry about an impending JLPT N2. It will double-count towards both my BS in Computer & Information Science and my AS in IT. It will teach me a new special-purpose programming language specifically for databases, SQL (Standard Query Language). He had an extremely low overall rating according to RateMyProfessor.com (only 1.6/5), but an easiness rating of 3.7/5, which is pretty easy (the chance of getting an A would be high). Since his course is specifically for UMUC Asia/Europe students, there will likely be some students in the class elsewhere in Japan, which could be good for networking. He expects us to buy a special custom textbook that is printed in Japan that costs $120 used. Professor Parcher: He has a much higher overall quality rating of 2.7/5, but is slightly harder (3.3/5 for easiness). His class is targeted at UMUC students in America (though I can still take it), which is not as good for networking as Professor Shah's class. The textbook is a free e-textbook! After thinking it over for a while, I decided on Professor Parcher. The course runs from June 2 to July 27, 2014. My slightly modified study plan is this: study hard for the JLPT N2/Kanji Kentei 4-kyū until July 6. Pass both of those tests, keeping up with CMIS 320 along the way. Once the tests are done, continue to work on CMIS 320 and reviewing a significant portion of precalculus (in preparation to take MTH 271, Applied Calculus I) until 7/27. Then, on 7/27, I will finally be back on schedule! FORTRAN (I made four programs as projects for the course in FORTRAN—a temperature converter [Celsius/Fahrenheit], a shipping calculator for orders to the U.S. and Canada, a bacteria calculator, and an income tax calculator for the State of Euphoria). I had to learn how to do all kinds of things in FORTRAN to do these things, from simple things (print *, '' and read *, [variable name], comments with !, and variable declarations like real) to some slightly more advanced things (functions, counter-controlled loops, dual-alternative structures, etc.). I am still an elementary-level FORTRAN programmer at best, but at least I now feel confident that I can use the GNU Project's gcc gfortran compiler to compile from-scratch FORTRAN code that I wrote myself. I programmed a yunnori (윷놀이) game as a bash shell program, with 250 lines of code. I used it to show decision structures, to show how to combine loops with if-then statements, and to show arrays in action, and made many posts about this in the conference. The yunnori game, in theory, allows two players to play a game of yunnori complete with crude, brown, ASCII block graphical yut (윷) sticks. However, the program is still extremely crude. In other words, I learned a ton from this course, though I will qualify that by saying that most of it was historical knowledge (i.e. not directly applicable in the computer industry today) and that the majority of what I learned was from independent projects for the conferences in which I chose what to research/do within certain guidelines. Still, I felt it was a rewarding experience to take the course, and it was nice to have an on-site course on the Yokosuka Naval Base. I got to meet people, including the professor. As a positive side effect of this, I also got to eat lots of Taco Bell and lots of other nearly-impossible-to-get-in-Japan foods. These days, I have an intensive work schedule that has me working six days a week. The good news is that I'm getting significant overtime pay, so I'm continuing to bank decent money as I go to college. This second bachelor's degree is so much easier, financially-speaking, than my first one! I am now only 24 credit hours away from a bachelor's degree in Computer & Information Science. I expect to finish sometime in 2015. I could theoretically drop my Japanese studies and just focus on the degree and work and finish as early as the spring of '15, I think, but there would be little point in that (I will probably be working at my current job until at least August '15 or maybe even into 2016, so there is no point in rushing the degree only not to use it for as much as a year). My next step at UMUC is to sign up for at least one or two UMUC courses for this summer. I am currently leaning towards just one course this summer, because I want to pass the JLPT N2 and the Kanji Kentei tests, and it will be nearly impossible to study for those if I have two UMUC courses going at the same time. So what will that course be? I think CMIS 242 (Intermediate Programming [with Java]) is the best choice. The reason for this is that it is the prerequisite for another course (CMIS 445, Distributed Systems), and also that if I finish it, I will be able to get the Career Studies Certificate in Application Programming from NVCC (Northern Virginia Community College). Once I knock the JLPT N2 and the Kanji Kentei 4-kyū out this summer, I will have more time to devote to the UMUC degree. IT is a slightly different field from Computer & Information Science, so my range of jobs would be a little bit wider. It includes calculus, which I've never had before, and may be necessary anyway if I plan to pursue a master's degree in this field at any point. It would allow me to get part-time work experience in computers while waiting to finish up the BS in Computer & Information Science, so I could graduate with a little bit of work experience already. A price tag of roughly $1,000 (well, $1,000 in additional costs—there are many sunk costs [i.e. 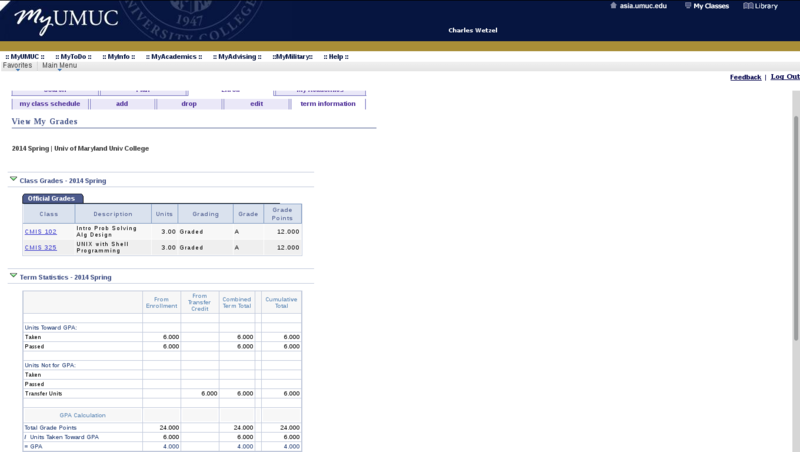 courses that I already paid for and completed a long time ago]). Of course, even limited graduation gifts could easily offset, nullify, or even reverse this. May 5-June 2: Intensive Japanese self study (keep up with Anki reps, start a listening comprehension routine, write at least three sentences and have them checked for each of the remaining ~100 grammar patterns, and memorize all the Kanji Kentei Level 4 kanji). Note that I do not necessarily expect to pass the N2 this time around. I am merely taking it on the chance that I will pass (most westerners who have passed this exam have spent between 1,400 and 2,000 hours studying Japanese, according to the Japanese Language Education Center [JLEC]—although I have probably spent that many hours studying Japanese, I have not had study that was as well-rounded as the average student of the Japanese language). Anyhow, I do not consider failing it to be failing, really, but just "not passing yet." I can take it again in December, and it will have zero impact on my plans. In fact, I might be able to pass it as late as December 2015 without it having an impact on my plans (but no later than that). Those plans for the summer look extremely (and overly) ambitious and perhaps they are. 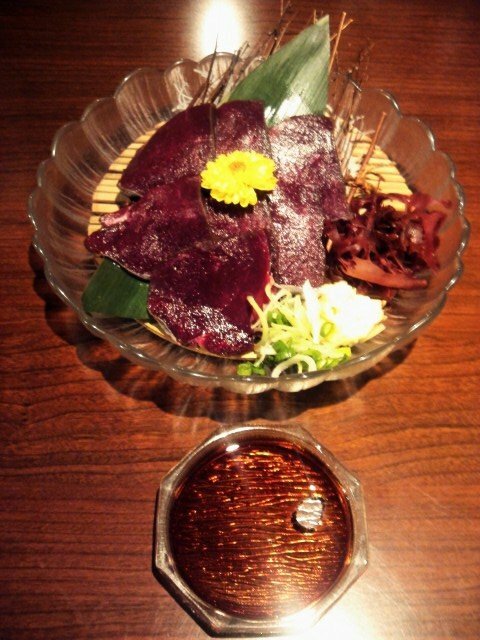 However, keep in mind, from late July to early September, I will be on vacation from my junior high school and have easily twice as much time to study as I normally do. I may choose not to complete the AS in IT and instead take more interesting courses through UMUC (special Japan- or Asia-specific courses only offered in Japan/Asia, or additional Japanese language classes, though I doubt they have them at my level, because a UMUC Japanese professor told me she didn't think they have any classes high-level enough for me at this point). The year that is marked on the AS in IT diploma will also have some influence on whether I decide to get the AS in IT. If I have both an AS in IT and a BS in Computer & Information Science both dated 2015, I think it'll cheapen both of them. I'd prefer to have the AS in IT marked with 2014 and the BS in Computer & Information Science to be marked 2015, to show a linear time progression between the two. I will also need to look at the value of the AS in IT in the job market. Sure, it is always cool to have more pieces of paper, but will it really help augment my BS in Computer & Information Studies, or will people largely ignore it once the BS is done? Since IT is a slightly different field from Computer & Information Science, I think it might augment the BS, but I'm not sure. December 7: Maybe take the JLPT N2 if I failed the first time. Click here to read old news. | Click here to read a brief explanation of what I do in Japan, and why I chose Japan.